Recently I was at Downtown Disney and had planned to go to the House of Blues to do a photo report. Unfortunately, when photographer Brandon Glover and I got to the restaurant they told us it would be a ten minute wait. This was in the middle of a weekday and the House of Blues was – at best – 30% full. There were even two parties ahead of us waiting to get a table. Acting on principal alone, the thought of waiting 10 minutes to get a table in an empty restaurant with so many other choices nearby seemed beyond ridiculous, so we left to try another venue. A couple steps down from House of Blues lies Bongos Cuban Cafe, so we decided to check it out since neither one of us had ever tried it before. 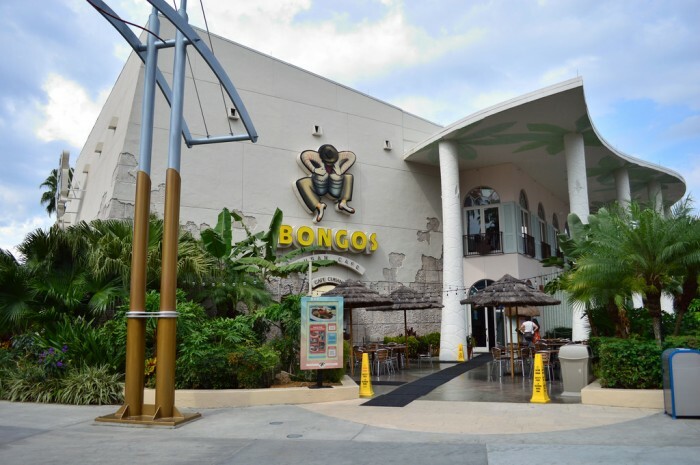 Bongos has an impressive presence in Downtown Disney’s West Side. A large white building surrounded by palm trees, there are elements all around the venue to take in including an actual set of bongos in the front, a water feature on the side, and a gigantic white pineapple in the back. 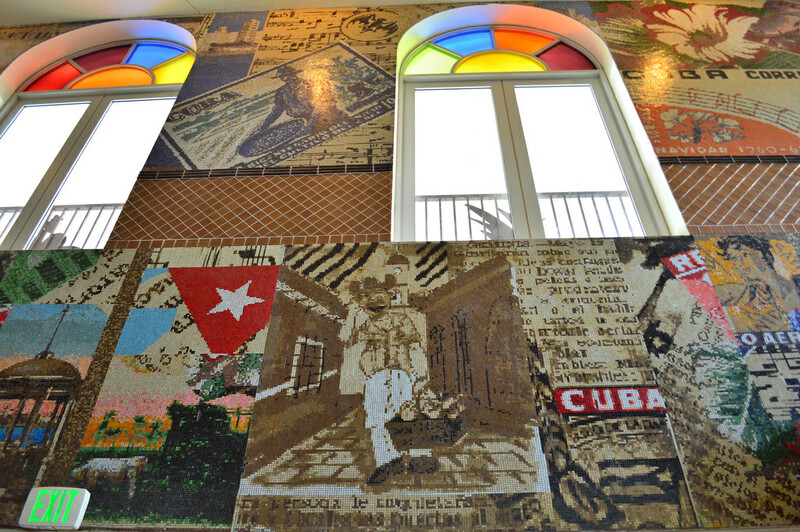 Water feature at Bongos Cuban Cafe. Backside of Bongos Cuban Cafe. Outdoor bar at Bongos Cuban Cafe. 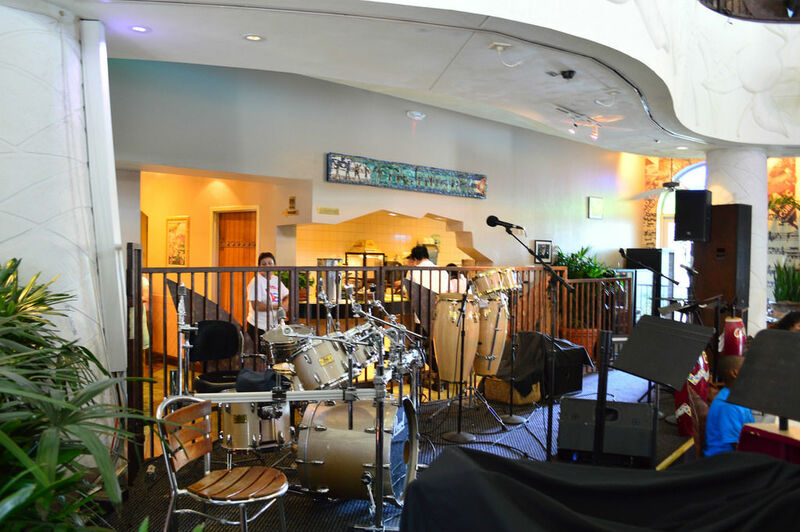 As with other Downtown Disney restaurants like Raglan Road and Paradiso 37, Bongos can be very lively at night with live music going on. During the afternoon it was much quieter. Live music at Bongos Cuban Cafe in the evening. 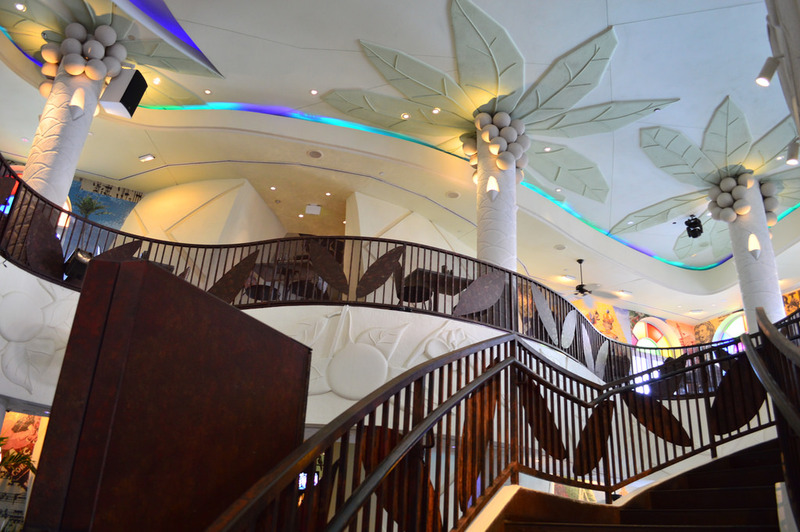 Upstairs at Bongos Cuban Cafe. The seating downstairs is wide open, and there are a lot of ceiling fans, so the restaurant felt comfortable despite it being nearly a thousand degrees outside (give or take 5 degrees). 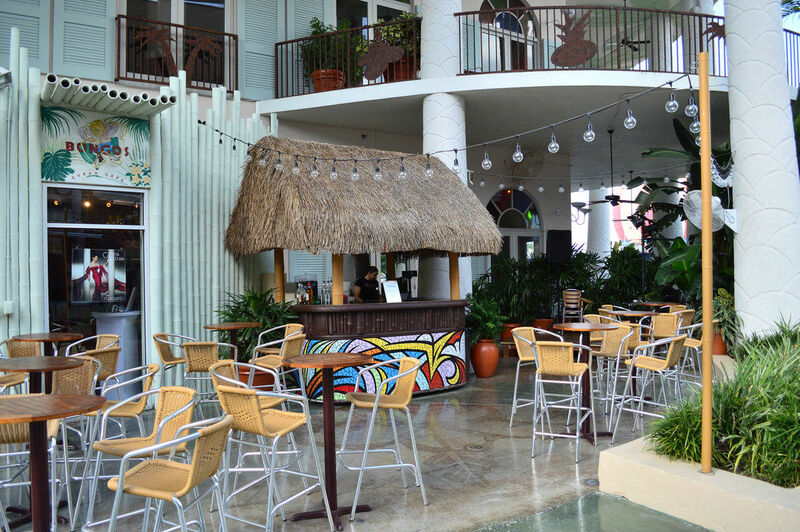 The indoor bar had seats seemed like actual bongos, while the tables had high backed seats that looked liked leaves. 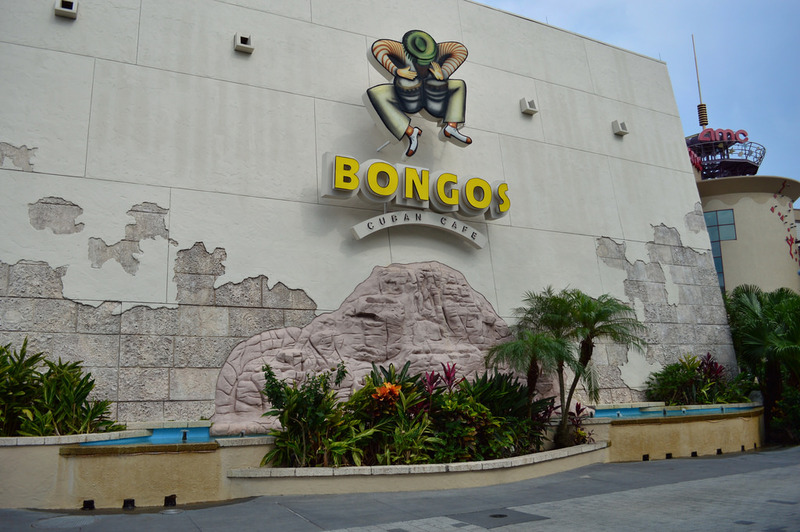 Like Splitsville, Bongos is deceptively huge inside. Inside bar at Bongos Cuban Cafe. For drinks we got the Havana Punch ($9.00). This drink is made with Bacardi Limon, Bacardi “O”, and orange, pineapple, and cranberry juices. Very tasty drink and quite strong. 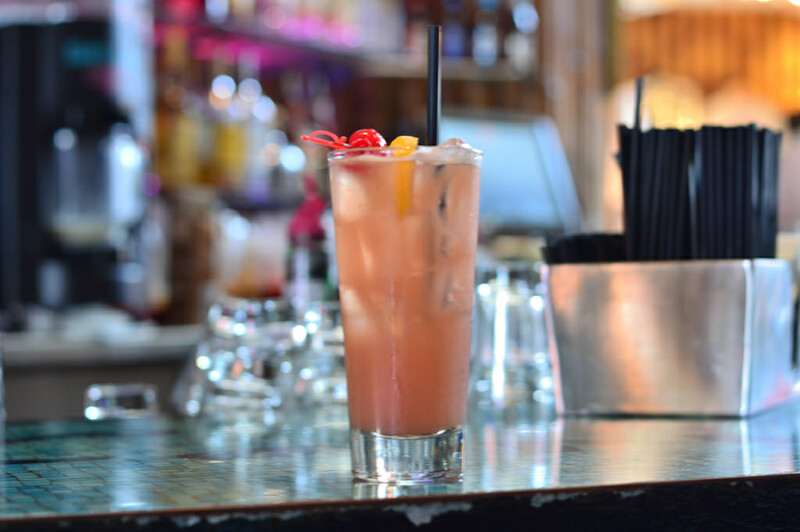 Havana Punch at Bongos Cuban Cafe. 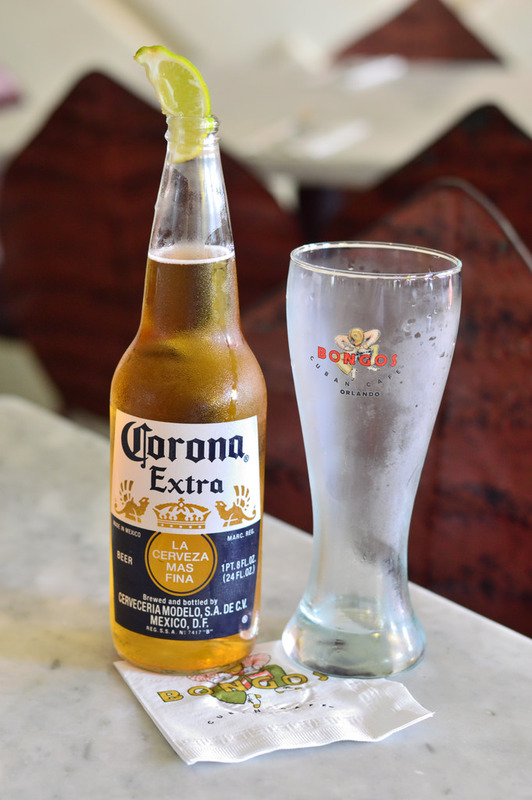 As a fan of souvenir glasses, I was drawn to the giant Corona, which you could get served in a Bongos glass to take home ($14.95). The bottle itself is 24 ounces, which is only double the size of an average 12 ounce bottle but seemed enormous. Even though I live in South Florida, I have never tried Cuban food despite a large amount of restaurants from West Palm Beach to Miami, so now you have a better understanding of why I made such a ridiculous decision ordering a Corona instead of a mojito. Then again, on my trip last year to Jamaica I chose Miller Lite over Red Stripe, so ‘Murica runs deep within me. Corona and souvenir glass at Bongos Cuban Cafe. For appetizers we got the Cuban Mojo Marinated Fried Pork Bites. This was cooked perfectly, and the meat was extremely tender. The serving size was pretty large, as there were several more pieces of meat underneath the onions you see in the picture. I would definitely order it again, as the flavor was wonderful ($10.00). 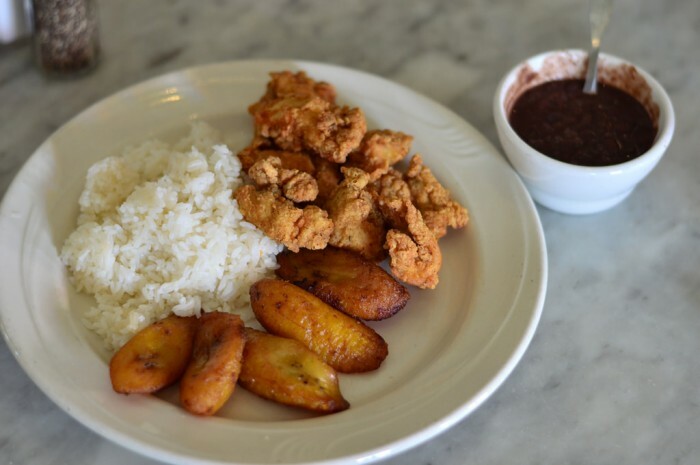 Fried pork bits at Bongos Cuban Cafe. 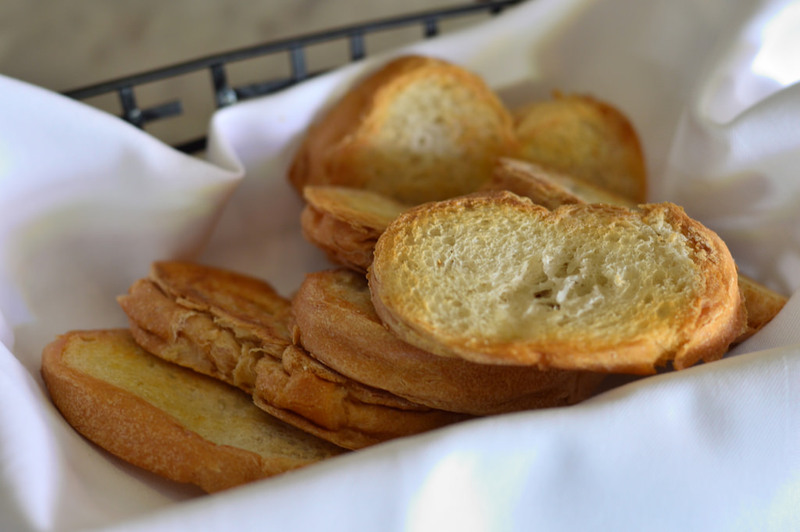 An order of Classic Cuban Garlic Toast complemented the pork bites. There was more of a garlic taste in the pork bites than in the bread ($3.00). Garlic toast at Bongos Cuban Cafe. 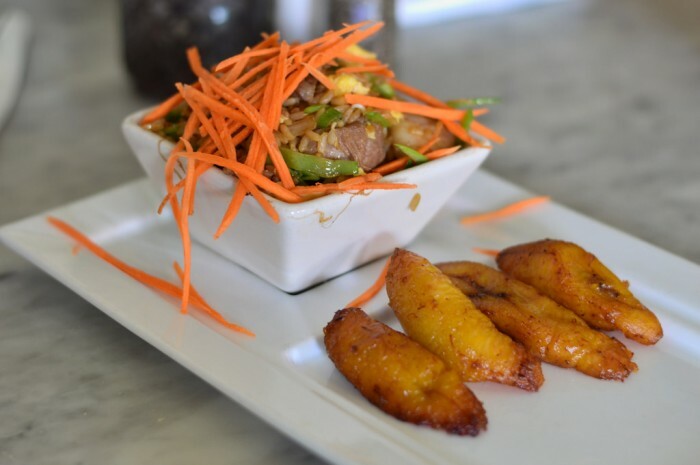 Our first entree was Bongos Famous Fried Rice: fried rice with pork, shrimp, beef, chicken, and vegetables served with sweet plantains. This was absolutely fantastic and a must-get if you go to Bongos. The serving size could be a bit bigger for the price, but what you get is fantastic ($17.00). Bongos fried rice at Bongos Cuban Cafe. The other plate was much more pedestrian: Chicken Bites. 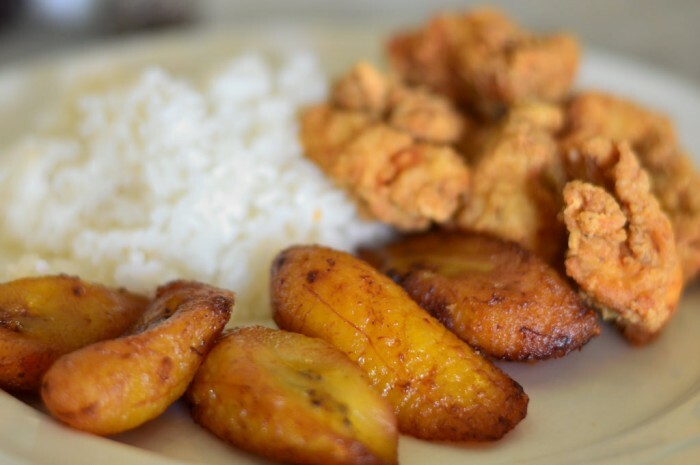 These are deep-fired chicken bites marinated in Cuban mojo and served with sweet plantains and white rice. The mojo marinated pork appetizer was much more flavorful than the chicken in this dish. The plantains were good, and I did enjoy the small cup of black bean soup that came on the side ($14.0o). Chicken bites at Bongos Cuban Cafe. 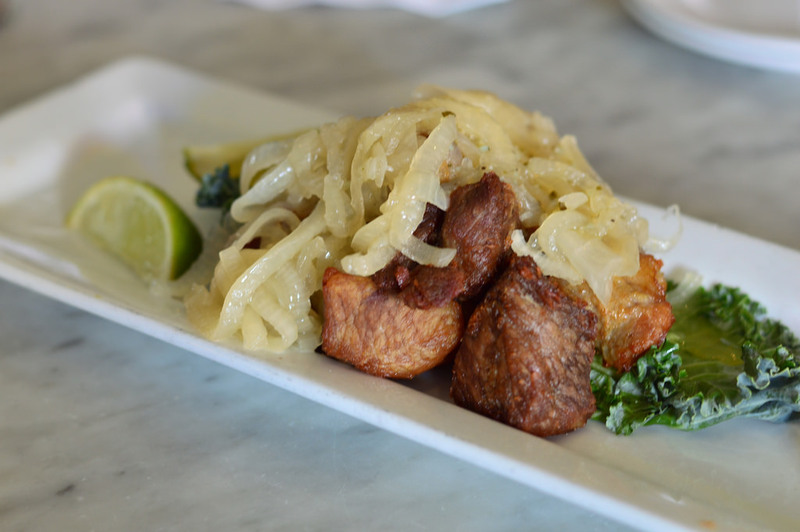 If you spend enough money on a camera, you can even make plantains look good. 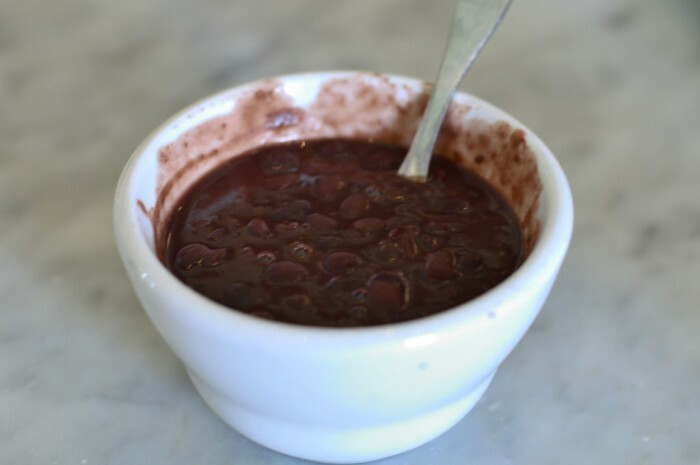 Black bean soup at Bongos Cuban Cafe. 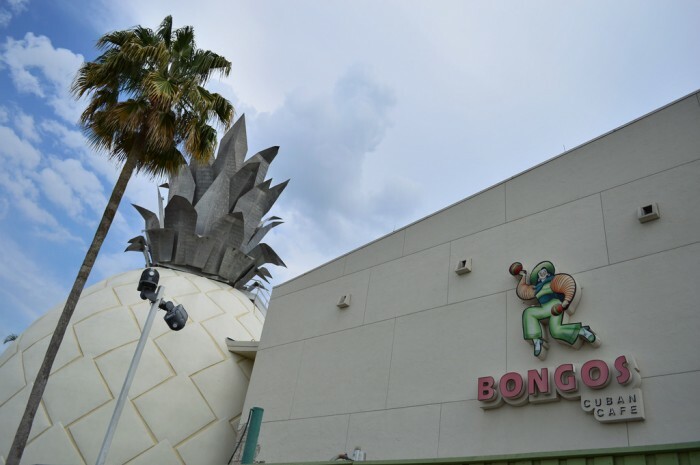 It seems like pretty much every restaurant at Downtown Disney has a large gift shop, and Bongos is no exception. What was surprising was the amount of autographed Gloria Estefan CDs that were available. I thought this was a nice touch. Bongos Cuban Cafe gift shop. 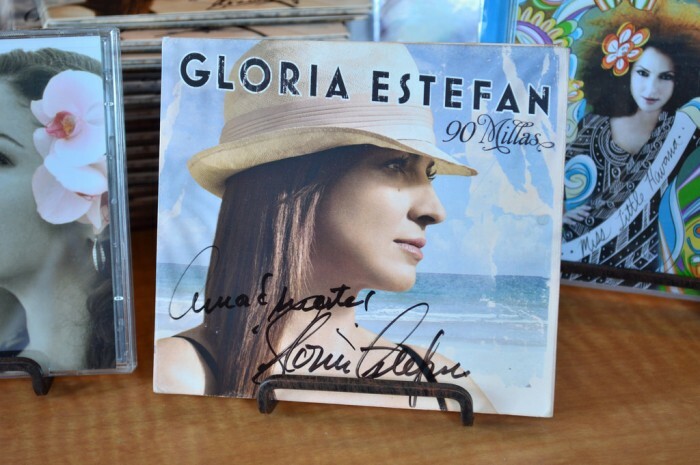 Gloria Estefan signed CD at Bongos Cuban Cafe. OVERALL THOUGHTS: I guess I have to thank House of Blues for sending me over to Bongos, as it probably would have been a long time before I tried the restaurant on my own. I do not consider myself the adventurous type when it comes to food, and I am more than happy to go back to places like Splitsville, Cookes of Dublin, and even (don’t laugh) Planet Hollywood to try more dishes. However, everything at Bongos ranged from decent to very good, so I would have no problem coming back to try some different items. 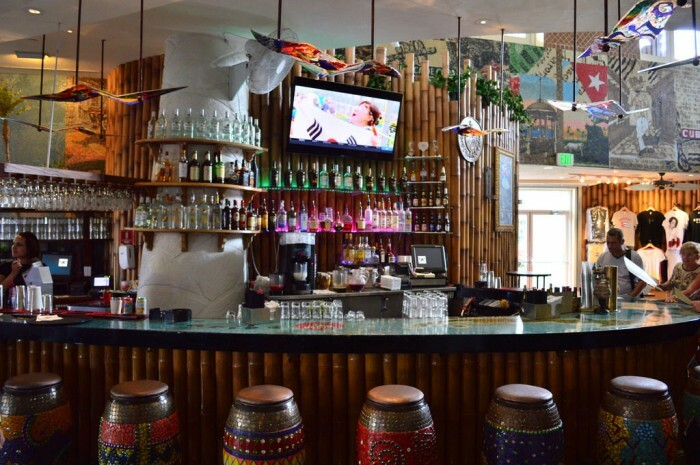 I still have to get that mojito, and while I’m there I wouldn’t mind trying the Cuban Fried Rice and Bongos Famous Fried Shredded Beef. Bongos does seem to have an extraordinary amount of “famous” items on the menu. 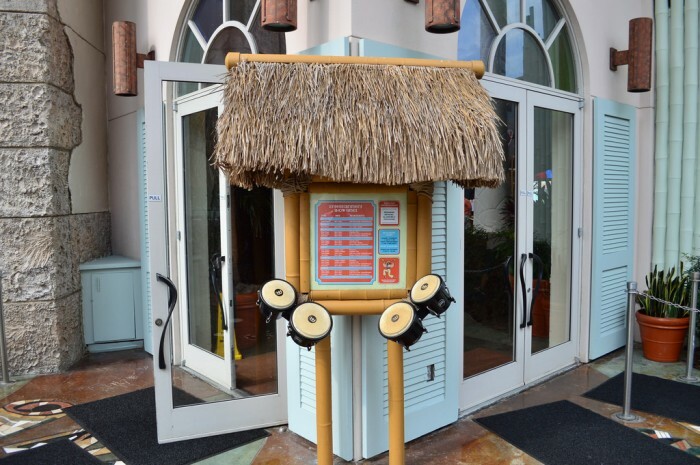 Although, to be fair, I can’t complain until one isn’t fantastic, and Bongos Famous Fried Rice was exceptional. All photos in this article are courtesy of Brandon Glover. This is a must for us. Even you don’t get a full meal, at least stop by the bar and have a Mojito and the Papa Rellenas (Fried Stuffed Potato Balls—-stuff with a spicy BBQ like beef). They’re one of my favorite foods on property. The bar setting at the downstairs bar is almost always available for a quick bite and a drink. I love going to Bongo’s. I missed it my last trip. I love the Arroz con Pollo, delicious. There are too many tasty appetizers, I plan on going hungry so I can enjoy my meal. It is worth the trip. 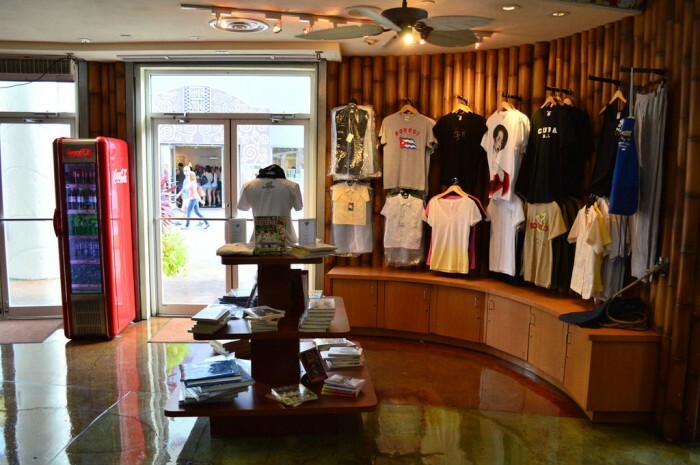 It is the only reason I am going to downtown Disney in October. I love the rice at Bongos! I think you hit the nail on the head with this review. 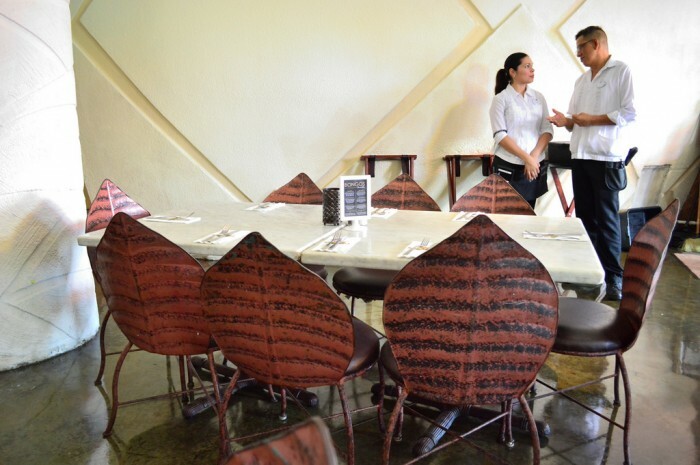 The dishes are surprisingly good and taste much better than any menu description could suggest. Great comfort food and a very unusual and fun selection! My only concerns when dining here is that the service is slow, but once you accept that, it’s not a problem as you relax and enjoy the atmosphere.